Greenwich’s Meghan Lynch competes in the 200 IM during the CIAC Class LL championship Wednesday at Southern Connecticut State University in New Haven. Lynch broke a state record, posting a time of 1:59:30. NEW HAVEN — With sophomore Meghan Lynch breaking records and Greenwich showcasing its superior depth, the Class LL girls swimming title was once again in the Cards. Adding to their expansive collection, the Cardinals kept their long-standing hold on the Class LL championship plaque. Behind numerous standout swims, Greenwich won the CIAC Class LL title for the ninth straight season, totaling a team score of 745 points at Southern Connecticut State University. Ridgefield was the runner-up (578), followed by Staples (516) and Trumbull (435.5). Amity (342), Glastonbury (338), Westhill/Stamford (321), Norwalk/McMahon (275), Southington (264) and Shelton (209) rounded out the top 10 teams. Greenwich has claimed the Class LL crown 17 times since 1998. Lynch drew loud applause from the crowd by winning the 200-yard individual medley in a state, Class LL and Southern Connecticut State University pool-record time of 1:59.30. Staples junior Esme Hunter was the runner-up (2:05.18), followed by Trumbull freshman Lauren Walsh (2:09.70) and sophomore Samantha Ennis of Greenwich (2:12.74). Lynch’s second record came in the last individual event of the meet, the 100 breaststroke. She registered a Class LL record time of 1:02.28 in getting the first-place medal. Trumbull freshman Lauren Walsh took second in 1:05.19, followed by Ridgefield’s Hannah Sotolongo and Jenna Leonard. Greenwich’s Caterina Li was fifth. In the 50 freestyle, Staples senior Marissa Healy garnered the first-place medal, clocking in at 23.76 seconds. Louise Kim of Shelton was second in the 50 freestyle (24.11) and Greenwich’s Hannah Seward had a third-place finish (24.30), while Southington’s Julia Duszak placed fourth and Hannah Snyder from Ridgefield took fifth. Following the 50 freestyle, Greenwich had 268 team points, while Ridgefield recorded 214 and Staples had 205.5. The opening individual event, the 200-yard freestyle, was won by Ridgefield senior Anna Turner, who touched the wall in 1:52.17. Lauren Diagnault placed second in 1:54.23, while Ridgefield’s Rylie Giles finished third (1:54.45). Stephanie Bishop gave Ridgefield additional points in a high-scoring 200 freestyle for the Tigers, taking fourth in 1:54.92. Regan Ryan from Trumbull finished fifth in 1:55.61. Staples captured the first winner’s medal of the night, taking first in the 200 medley relay. The quartet of Hunter, Bowens, Healy and Olvia Utter registered a winning time of 1:46.91. Greenwich was second in 1:47.01 and Trumbull placed third (1:49). The 100 freestyle saw Kim from Shelton earn top honors, as she touched the wall in 52.80. Ludlowe’s Lily Kernaghan placed second (52.94), followed by Greenwich’s Emily Warner (53.15). Mia Zajac of Trumbull finished fourth and Darianna Torres Gonzalez of Westhill/Stamford was fifth. The 500 freestyle championship went to Turner, who grabbed her second first-place medal for the Tigers. Turner notched a time of 5:00.34, while Norah Rome from East Haven/Cross took second and Giles of Ridgefield finished third. Greenwich senior captain Allison Brea posted a fourth-place finish in the 500 freestyle. Hunter of Staples was the 100 backstroke winner in 56.28, while Ludlowe’s Lily Kernaghan placed second in 58.01 and Greenwich’s Samantha Ennis took third (58.93). Faith Somody from Westhill/Stamford placed fourth in the 100 backstroke. Emma Panaroni of Hamden took sixth in the backstroke. “It was a really long road getting here, but I showed what I can do and I know I can do a lot better at the Open,” Hunter said. Staples’ foursome of Hunter, Bowens, Morgan Lenoce and Healy captured the 200 freestyle title in a state-record showing of 1:36.42. Healy also finished first in the 100 butterfly (55.15), with Hannah Seward of the Cardinals taking second in 56.21 and Amity’s Katherine O’Connor placing third (57.81). Capping the meet in style, the Cardinals claimed the 400 freestyle relay title in 3:29.33. Lynch set another Southern Connecticut pool record while joining her teammates in the 400 freestyle relay. Her time of 50.77 in her 100 yard swim leading off the relay established the record. 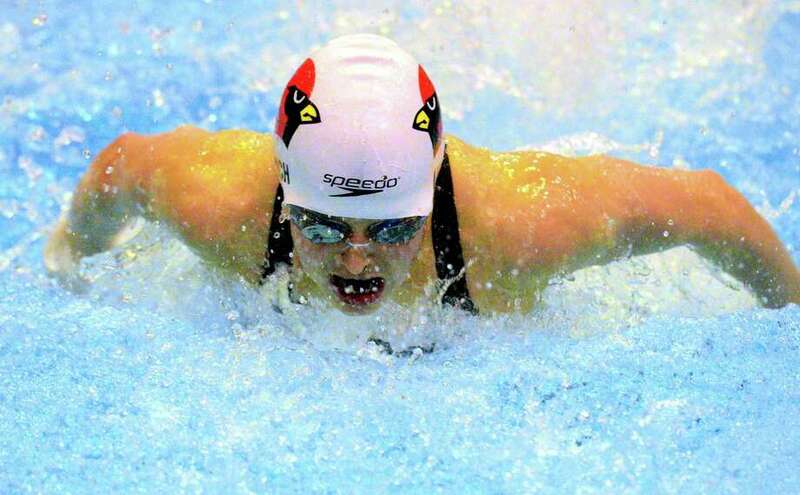 Jenna Handali, Emily Warner and Seward also swam in the winning relay for the Cards. The CIAC State Open takes place Saturday at Yale University at 12 p.m.
1. Greenwich 745, 2. Ridgefield 578, 3. Staples 516, 4. Trumbull 435.5, 5. Amity 342, 6. Glastonbury 338, 7. Westhill/Stamford 321, 8. Norwalk/McMahon 275, 9. Southington 264, 10. Shelton 209, 11. Ludlowe 198, 12. Newtown 185.5, 13. Hamden 145, 14. Enfield/Somers 132, 15. East Haven/Wilbur Cross 118, 16. Warde 110, 17. West Haven 95, 18. East Hartford 94, 19. Manchester 59, 20. NFA 50. 200 medley relay: 1. Staples (Esme Hunter, Annie Bowens, Marissa Healy, Olivia Utter) 1:46.91; 3. Trumbull (Mia Zajac, Lauren Walsh, Julia Nevins, Regan Ryan) 1:49.00; 5. Amity (Molly Cox, Emma Grabowski, Katherine O’Connor, Kalynna Hauser) 1:50.60; 200 freestyle: 1. Anna Turner (Ridgefield) 1:52.17; 2. Lauren Daignault (Norwalk/McMahon) 1:54.23; 5. Regan Ryan (Trumbull) 1:55.61; 200 IM: 1. Meghan Lynch (Greenwich) 1:59.30 (state record); 2. Esme Hunter (Staples) 2:05.18; 3. Lauren Walsh (Trumbull) 2:09.70; 50 freestyle: 1. Marissa Healy (Staples) 23.76; 2. Louise Kim (Shelton) 24.11; 6. (tie) Mia Zajac (Trumbull) and Anne Bowens (Staples) 24.64; 100 butterfly: 1. Marissa Healy (Staples) 55.15; 3. Katherine O’Connor (Amity) 57.81; 4. Regan Ryan (Trumbull) 58.58; 5. Lauren Daignault (Norwalk/McMahon) 59.08; 6. Julia Nevins (Trumbull) 59.45; 100 freestyle: 1. Louise Kim (Shelton) 52.80; 2. Lily Kernaghan (Ludlowe) 52.94; 4. Mia Zajac (Trumbull) 53.35; 500 freestyle: 1. Anna Turner (Ridgefield) 5:00.34; 200 freestyle relay: 1. Staples (Esme Hunter, Anne Bowens, Morgan Lenoce, Marissa Healy) 1:36.42 (Class LL record); 3. Shelton (Emma Parkes, Louise Kim, Anastasia Alcaraz-Sim, Alyssa Bretan) 1:40.50; 4. Trumbull (Julia Nevins, Regan Ryan, Ashleigh Piro, Mia Zajac) 1:40.88; 5. Amity (Emma Tirollo, Kalynna Hauser, Julia Snow, Katherine O’Connor) 1:41.98; 100 backstroke: 1. Esme Hunter (Staples) 56.28; 2. Lily Kernaghan (Ludlowe) 58.01; 100 breaststroke: 1. Meghan Lynch (Greenwich) 1:02.28 (Class LL record); 2. Lauren Walsh (Trumbull) 1:05.19; 6. Anne Bowens (Staples) 1:08.08; 400 freestyle relay: 1. Greenwich 3:29.33; 4. Staples (Jessica Qi, Mia Fraas, Michelle Kennedy, Morgan Lenoce) 3:38.32; 5. Trumbull (Karina Walsh, Ashleigh Piro, Jacqueline Dale, Lauren Walsh) 3:40.20.